It really doesn’t matter which D.C. sports team you root for these days. They all end in heartbreak and disappointment. Long-time fans of the Washington Capitals know that this franchise has never really done well in the postseason. Whether we’re talking about multiple overtime games or going up three games to one in a series and being unable to finish off an opponent on the ropes, the Caps have historically tortured their fan base on a level that should be punishable by law. Graybeards like me know playoff letdowns are an annual tradition, and are able to adjust their expectations accordingly. But I still feel for those relatively newer additions to the local hockey-loving community. Those who have only been here for the “Rock the Red” era of the Capitals clearly had no idea what they’d signed up for. They simply saw dynamic playmakers on the ice and larger than life personalities off of it and decided to give the Caps a try. Little did they know they had just entered into an abusive relationship. But really, their first clue should have been that this franchise was located in Washington, D.C. That alone should be enough at this point to make people proceed with caution. Take, for example, the Nationals. After relocating from Montreal, the Nats came to town and spent their first seven seasons in Washington bringing next-to-nothing to the table. Aside from going 81-81 in their inaugural season, the Nationals didn’t really give casual sports fans a reason to spend the day at the ballpark – posting a losing record in six of their first seven seasons in town. Then, last season, everything inexplicably came together for the Nats. After years of ineptitude, the Nationals were suddenly the best team in baseball. They strung together a league-best 98 wins in 2012, captured their first NL East title since ’94 (when the franchise was still known as the Expos) and headed into the postseason as a legitimate contender. And then they collapsed in the worst-possible way imaginable. In the fifth and final game of the NLCS NLDS, the Nationals jumped out to an early 6-0 lead against the St. Louis Cardinals and everything seemed right in the universe. The season started with zero expectations, and yet, Nats fans were giddy at the thought of a magical postseason run. And then, needing just one out to close out the series, Washington’s bullpen imploded in the ninth inning. With the game on the line, it seemingly didn’t matter who Nationals manager Davey Johnson turned to – none one could handle the pressure of the situation. The team allowed four runs in that fateful inning and completed a collapse that was so horrific, even longtime Caps fans – folks who are usually numb to this sort of thing – felt sick to their stomach. Next up, the Washington Redskins. Upon the arrival of Heisman Trophy winning quarterback Robert Griffin III, optimism was at an all-time high in our nation’s capital. Realistic sports fans admitted that it would probably take some time to build the rest of the team around the new face of the franchise and the team’s 3-6 seemed to only strengthen that belief. Of course, the Redskins stormed out of the bye week and reeled off an unimaginable seven-game winning streak to capture the NFC East and earn a trip to the playoffs. The biggest team in town was suddenly relevant once again and D.C. sports fans once again allowed themselves to be sucked in – openly daydreaming of a return to the franchise’s glory days. And then, just like that, it was all gone in the blink of an eye. RGIII’s knee was torn to shreds and in worse shape than the field conditions at FedEx Field and ‘Skins fans were suddenly wondering if the most dynamic playmaker to don the burgundy and gold in recent history was ever going to be the same again. If you’ve picked up on the pattern, then you know what happens next. 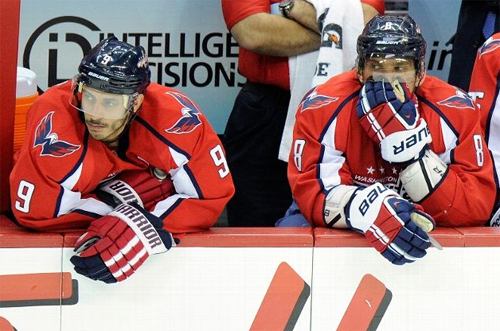 After a prolonged lockout, the Capitals returned to action with lowered expectations. Adam Oates became the team’s third coach in 18 months, but did so without the benefit of a standard offseason to teach the players his system and style of hockey. The Capitals stumbled out of the gate – starting a league-worst 2-8-1 – and people were openly wondering if the franchise’s core players were still worth building a team around. A 2-1 loss to the hated Pittsburgh Penguins on March 19 dropped Washington to 12-16-1 and the franchise had just a three percent chance of making the playoffs – which made the team’s magical turnaround all the more enjoyable. The Caps closed the season as the NHL’s hottest team – going 15-2-2 down the stretch to capture yet another division title and give Caps fans a reason to believe this year was going to be different. And then the Capitals ran into yet another “hot goalie.” Even after jumping out to a 2-0 series lead against the New York Rangers, the Caps couldn’t get the job done. Rather than sticking with what was working, Capitals players stopped crashing the net with any regularity and began to fall back into their old bad habits. Caps players once again began to settle for long-range shots that had little chance of getting past a world class netminder like Henrik Lundqvist. They allowed themselves to be suckered into foolish retaliatory penalties. They continually got overly cute and tried to make the perfect pass rather than simply driving the net and being content with scoring the type of greasy goals that make a different in the postseason. *Look, I won’t argue with anyone who truly believes the Rangers were the better team in this series. I just think the Capitals jumped out to an early lead, got a little too confident and/or comfortable and then let off the gas and stopped doing what was working. And once again, a Washington-based sports franchise completed the cycle of sucktitude: start slow, heat up, win an unlikely division title and then suffer a heartbreaking playoff collapse. It’s at times like these that you learn to truly learn to appreciate a franchise like the Washington Wizards. They don’t ever try to toy with our emotions. Rather than get anyone’s hopes up like the other local teams, they’re happy to stay terrible. And for that, I am truly grateful. Dear Ted Leonsis, please signed Ernie Grunfeld to a lifetime contract now to ensure there is one less local franchise capable of ripping out the hearts of D.C. sports fans. Better yet, does anyone have Vinny Cerrato’s phone number handy? I’m not sure I have a whole lot to say about this. There’s a reason I sold most of my playoff tickets. That will be a new trend for me. Playoffs round 1? No thanks. I’ve been there. Call me when its round 3. Nats lost in the NLDS, not NLCS. Good post though.